Stephanie J. 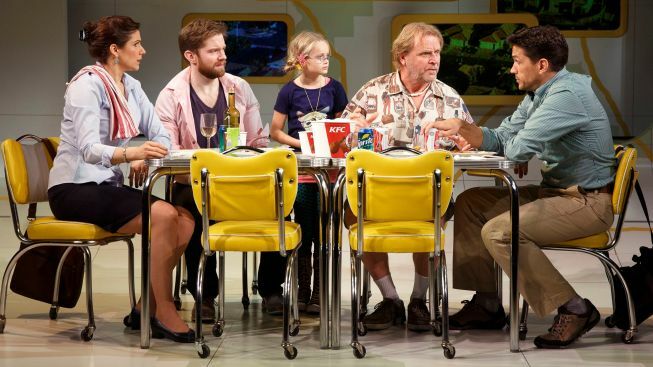 Block, Rory O'Malley, Hannah Nordberg, David Rasche and Will Swenson in "Little Miss Sunshine." For a story with built-in urgency — the Hoover clan simply must make it the 800 miles from New Mexico to California in time for daughter Olive to compete in a pre-teen beauty contest — remarkably little feels at stake in the hotly anticipated new musical “Little Miss Sunshine,” which has just opened at Second Stage. Matters start promisingly. A glance skyward reveals a winding Google Maps-style set dressing that stretches from back of the stage, up the roof, to the recesses of the theater. My companion said it made the venue look like a dolled-up Fro-Yo shop; I thought it was cool. It’s a helpful reminder that most of the film transpires in a relentlessly unreliable VW bus. And I wondered how Lapine, who also directs, would replicate that essential element for the stage. The answer is via creative use of six cushioned chairs on rollers, in place of an actual vehicle. Dour dad Richard (Will Swenson, “Hair”) places his hand on the “wheel” attached to the front seat, and off go the financially strapped Hoovers, chief among them Stephanie J. Block (“… Drood,”) as mom Sheryl, and appealing newcomer Hannah Nordberg as Olive (“Some of her favorite roles,” according to her Playbill bio, “include Gaston in ‘Beauty & The Beast’”). David Rasche (TV’s “Sledge Hammer!”) mostly squanders an opportunity to leave his mark on a role that won Alan Arkin an Oscar, infusing his hell-raising Grandpa with plenty of crassness, but little to find endearing. Part of the problem may be that he just doesn’t have a memorable song. Rory O’Malley (“The Book of Mormon”) turns in a winning performance as Frank, Sheryl’s brother, who is recovering from a suicide attempt. O’Malley gets a swell turn with the sarcastic “How Have I Been?” set at a roadside rest area, where he unexpectedly encounters the boyfriend who dumped him for a fellow Proust scholar. O’Malley’s moments with the delightful Logan Rowland (“The Addams Family”), as Olive’s brooding older brother, are charmers, notably when the duo bond over air hockey as Olive readies for the pageant. Those memorable movie scenes where the van gets cantankerous and the family has to give it a rolling start are handled effectively with choreography and lighting effects. There’s a Siri-like GPS voice who plays a grander role in the proceedings as the single-act musical motors on. “Little Miss Sunshine,” which clocks in at an hour-and-45-minutes, was far lengthier during its 2011 run in La Jolla. I’ve got to wonder how the show would be experienced if the creatives restored some of what was taken out. In the meantime, I was left wondering what ever made Finn and Lapine view “Little Miss Sunshine” and think: “Let’s turn it into a musical!” I’m just not sold on the idea that such a featherweight, if uplifting narrative ever demanded a melodic treatment. “Little Miss Sunshine,” through Dec. 15 at Second Stage’s Tony Kiser Theatre, 305 W. 43rd St. Tickets: $65 and up. Call 212-246-4422 or visit 2ST.com.